Once you get your garden and yards designed by expert landscapers, the next thing to do is to ensure that these spaces are also looked after well. The plantings, trees, lawns and all the masonry elements will look good right round the year only if they are maintained well. Regular care of all these elements requires time, knowledge and consistency, and its best to hire experts for the job. Damon Johnson provides excellent landscape maintenance services to customers in and around Edmond and Oklahoma City. Landscape maintenance is never a cut and dry job. It involves understanding what kind of plantings exist on the property and identifying which solutions would work best for these installations. Every landscape also has different types of plants, shrubs and trees. 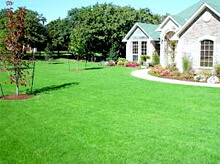 Even lawns can have different types of grasses and the soils on different properties could vary as well. This is why credible and experienced landscapers will always take care to design custom landscape care contracts. Since these are specifically designed for you, it helps ensure that all your softscaping gets the attention and care it needs. The schedule for the landscape maintenance services will be set based on the number and types of plants and trees you have and what the spread of the landscape is. Regardless of the size of your gardens and yard, opting for landscape maintenance offers a number of benefits. It will help ensure these spaces and all the elements in them stay looking good all through the year. When you have trees on your property you need to focus on maintaining them well. Hiring landscaping experts like Damon Johnson ensures you get the kind of solutions you need at landscape maintenance cost that will fit perfectly into your budget.